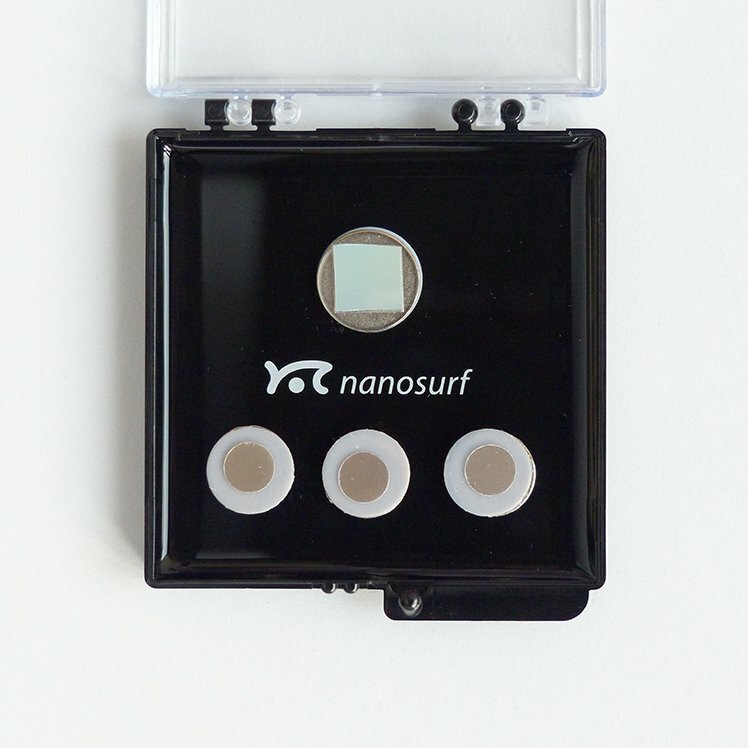 The dynamic imaging mode kit provides a DVD sample that is well suited to start with dynamic mode AFM measurements. The steep features of the DVD structure can be used to study the effects of imaging parameters on the image quality. Thus, this sample can be used to practice fine-tuning of the imaging parameters. The kit also includes mica sample supports. Mica is a layered crystal that can be easily cleaved using scotch tape and thus provides large atomically flat and clean surfaces. Mica can be used to adsorb e.g. nanoparticles that require very flat substrate surfaces. DVDs exhibit a structured layer that is usually covered sandwiched between two 0.6 mm thick polycarbonate discs. Upon removal of one of these discs, the structured surface becomes exposed and can be imaged. The length of the pits in the surface is used to code the data of the DVD. The width of the pits and separation of tracks are defined to be 320 nm and 740 nm, respectively.